The proposed 24-storey skyscraper at 100 Avenue Road has loomed over Swiss Cottage and overshadowed the community for several years. It was granted permission by the Planning Inspectorate a few years ago, but that doesn’t mean that Camden’s job is done. Indeed, the Planning Committee, on which I sit, still has a say. In July, we voted not to agree the proposed Construction Management Plan, which details how the building will be built. After that rejection, it came back unamended to the Planning Committee last week. I was disappointed to see it come back unamended, I was disappointed to see the feedback I gave in July about the harm to the area was ignored, and I was disappointed to find myself in the minority – outnumbered by the four Labour members that voted for the CMP to go through. However, I was most disappointed by the answer that officers gave to my question about alternatives. The Labour councillors that voted for the plan claimed that the alternatives were unworkable, as TfL refused to close one of the five tube exits at Swiss Cottage, and thus the ‘pit lane’ for construction traffic could not be extended sufficiently to allow the alternative. I asked whether Camden Council had lobbied TfL or the Mayor of London and asked them to close the tube exit. The officer replied that they had not, because the Council agreed with the proposal anyway. To me, this was unacceptable. Camden had effectively acted to deny the Committee the opportunity to explore alternative options. The proposal that was passed will kill off the market and require the use of large swathes of Swiss Cottage Open Space – all so Swiss Cottage tube station can have five exits instead of four during construction works. 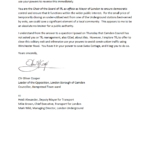 Flabbergasted by the officers’ response, I wrote a letter the next day to the chair of TfL Board, Sadiq Khan, asking him to overrule the decision not to allow the exit to close. This would help save Swiss Cottage, and rescue it from Camden Council’s negligence. 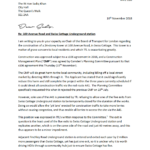 The full letter can be read by clicking on the image below.